Please consult the list of frequently asked questions below before submitting your question here. It is very likely you will find the answer. Q: Can current and/or future government SBIR funds that are awarded to a small business be considered for the 50% cost matching requirement? A: Per the Terms and Conditions of NC State’s Cooperative Agreement with DOE, “the Recipient may not use Federal funds to meet its cost sharing obligations, unless otherwise allowed by Federal law”. Q: If a university applicant is part of an Industry project, would the funding allocated to them for their particular Topic/Subtopic limit their total funding for other university projects they may be pursuing? A: Yes. Also note that a university is only eligible to receive one award per P.I. in Focus Areas 2-4. However, a university P.I. is eligible to receive one additional award on Focus Area 5. Q: I just want to confirm that National Laboratories can submit proposals, either as the Prime or as a subject partner, in response to Topic 4 of the Call for Proposals. A: National labs can submit proposals. They are still subject to the 1:1 cost matching requirement. Labs may partner with industry to obtain some or all the cost matching. Q: Could the matching from companies be in the form of in-kind? Q: Can two sections within Focus Area 2 (2.2 and 2.5) be combined into one Concept Paper/Proposal? A: Yes. Please note we are looking for technologies that are beyond the concept feasibility stage, a demonstration by the end of the 12 month project period, and a path to commercialization. Universities and National Labs are encouraged to collaborate with large companies to have a commercial path for their innovations. Q: Where can the quad chart template be found? Q: For topic 4 projects, would the funding allocation for industry/academia project be exact $800K for industry and $300K for academia? Or can it be flexible? A: For topic 4 industry/University project collaboration, the funding will be up to as much as $800K for industry and up to as much as $300K for academia. The allocation is firm. Q: For Collaborative Industry/University Projects, does it mean both industry and university need join PowerAmerica? Or just at least one member joining is fine? A: PowerAmerica funding is only available to members. Both industry and university need to join PowerAmerica to receive funding. Q: We wanted to inquire whether the proposal/concept paper can be multi-year (say in response to topic 3.1), or whether they should strictly be for 1 year following the maximum funding guidelines mentioned in the Call for Projects. A: The concept paper should be strictly for 1 year following the funding guidelines mentioned in the Call for Projects. Q: For Topic 3.1, the funding limit is up to $800K for industry, and up to $400K for university and national labs. For a project team composed of an industry institution, a university and a national lab, please clarify whether the university and national lab can each receive $400K, or whether the $400K needs to be divided between the university and national lab in some way. A: For a project team composed of an industry institution, a university, and a national lab, each would receive the amounts listed. Total funding for such a project would be up to $1.6M. Q: Is there any strict requirement on the company background in terms of shareholder structure? like 100% US ownership or some equity percentage can be owned by the foreign entities outside the USA, e.g. : 30% equity is owned by a Germany company etc..
A: No, there is no strict requirement on the company background in terms of shareholder structure. Institute membership is open to all U.S. industrial organizations (incorporated or formed under the laws of a State or territory of the United States that maintain a significant manufacturing presence in the U.S.), academic institutions, non-profit organizations, governmental agencies and other U.S. based entities committed in furthering technology related to Wide Bandgap Semiconductors and Power Electronics. Foreign-owned or partially foreign-owned organizations with a U.S. manufacturing presence may, with the approval of the Executive Director, be eligible for membership when the organization’s participation in the Institute would be in the economic interest of the United States and aligned with the vision and mission of the Institute. Q: Are applicants required to become members of PowerAmerica before whitepapers/proposals are submitted, or can they wait until after proposal selection to become members? A: Waiting until selection of a Full Proposal is acceptable. Q: What is the total page limit for the Concept Paper? A: Concept Papers are limited to six pages. The required Quad chart is additional. Q: Is it possible to submit a project that is an extension of an already submitted OIF white paper? A: The concept papers and projects will be evaluated on their own merits independently from previous submissions. Q: Can PowerAmerica help obtain high voltage devices (10 kV and 3.3 kV) for projects to be conducted in Budget Period 5? A: PA will assist with obtaining 3.3 kV, 6.5 kV, and 10 kV engineering samples. $50K should be allocated in the budget toward the cost of high voltage device/modules. No detailed device/module cost breakdown is needed at the concept paper stage. Q: For the contact person information, should I put myself (PI) information there or the university Business/Administrative POC? A: List whoever should receive the notification of the encourage/discourage notice. There is also a spot to add an email address for someone else who is not the person completing the submission but needs to be informed of status updates. Q: In the membership application form, there are manufacturing related questions, for example: “Number of manufacturing workers based in the U.S.”, “Location of principal U.S. manufacturing site(s) related to WBG”, “Manufacturing presence outside U.S.”. As an academic member, we don’t have this information. Can we put N.A. as the answer? A: Yes, please put N/A. Q: For Topic area 4 can a university partner with an industry that is not a PowerAmerica member (but a leading manufacturer of products in the topic areas) with that industry not receiving any funds from PowerAmerica? Will this qualify as a path towards commercialization? What IP rights will the industry have in this scenario? How will it be affected if the industry also provides cost share – either cash or in-kind? A: University proposals are encouraged to partner with Industry. Partnerships with industry with a strong commercialization plan greatly strengthen a proposal. The industry partners do not have to be PowerAmerica members, but the commercialization efforts should have a US manufacturing component. No PowerAmerica funds will go to non-members. If an industry member is contributing to the university’s cost share match, the value of that match should be documented and described in the cost share commitment letter (Full Proposal only). IP rights are determined by the membership agreement and bylaws. Q: I know you have clarified that National Laboratories can participate in this call, but our contracting office requests verification that we can participate as an FFRDC (Federal Funding Research and Development Center). Can you confirm? We are aware of the cost share requirements. A: Yes, FFRDCs can participate. Q: If two companies team for a proposal, does the cost share have to be shared proportionally? Or can the team members divide the cost share as they want (as long as the total cost share requirement is met)? A: The total cost share must be met. It doesn’t have to be proportional. Q: Can the Quad Chart, the Gantt chart and the budget estimate each take one page in the Concept Paper? A: The Quad Chart, the Gantt chart, and the budget estimate can each take one page in the Concept Paper as long as total number of concept paper pages is not exceeded. Q: For university-led projects, could industry collaborators provide cost share if they are not PowerAmerica members? For university-led projects, if industry partners would receive a small amount of the fund as Co-PIs, sub-contractors, or consultants, do they need to be PowerAmerica members in these cases? A: Collaborations can occur in a variety of ways. Non members can provide cost share. Membership is encouraged for industry collaborations where technical collaboration is occurring but can be evaluated on a case by case basis. Some small services or purchases by subcontract do not require membership. to the sub-contractor, can the sub-contractor show $150K of cost share (in kind or cash) or the entire cost share should have to come from the lead. A: The subcontractor can cost share part of the funding. Q: When you say that university can get $300K on a project, is that $300K total or $300K from PA and $300K from cost share for a total of $600K? A: The latter. A university can receive up to $300K from PA and the university must match that with another $300K for a total university project budget of $600K. Q: I see the EERE Budget Justification excel file has a space for the Award Recipient name at the top of the Instructions page. In this case, I’d expect a separate file should be submitted for each partner requesting an award within a proposal? A: A given full proposal should have only one (1) EERE 335.1 budget justification submitted by the lead organization. Partner organizations should be considered “contractors” and listed as such in the EERE 335.1 of the prime. The only exception to this would be if a contractor is budgeted for $250K or more federal dollars, in which case the prime partner would need to submit their EERE 335.1 as noted above *plus* a separate EERE 335.1 detailing the budget of the partner contractor. Q: Although you are requesting only one EERE-335.1 Budget form although our proposal is made up of 3 organizations all each seeking a DoE cost match, will the DoE matching funds be disbursed separately to each organization by PowerAmerica? We were under the impression that PowerAmerica manages all subcontracting rather than the lead organization. Please clarify. A: Only one EERE 335.1 form is needed for a project unless one of the contractors has a budget of $250K or greater. As discussed in the Call for Projects document, we expect proposals to be submitted by one lead organization with any partners incorporated into the budget/SOPO as contractors. So federal dollars flow to the lead organization and flow through that organization to the other partners in the form of subcontracts. PowerAmerica will only issue one subaward to the lead organization. Q: We have a project in which there are two subawards. For the cost share requirement, can just one of the entities cover all of the cost-sharing for the entire project or is it required that each entity has to meet the 1:1 match for their own budget? A: One entity can cover all of the 1:1 cost matching requirements. Q: Is the membership fee based on calendar year or just for project duration. In other words, is the total membership fee $100K or $50K only because the project is only for one year duration? A: Membership is for a 12 month period that starts when your membership paperwork is completed. Your membership year does not have to correlate exactly with the funding year timeline. A $50k membership at the affiliate level would cover one year of membership. A: Yes, for a collaboration project award both the university and the company have to become members. Annual fee for a university is $10K. Membership fee cannot be used as part of the project match. Q: If a Company or University applicant utilizes a Service Center at NC State University as a resource vendor, does that preclude or limit the faculty associated with the Service Center from submitting proposals? Does it impact the applicant as well/instead? A: No, this will not have an impact provided all other requirements are met for a given applicant. Q: We would like to submit proposal to build applications using device structures that Power America funded to create last year. This will enable wider commercialization of the last year’s development work. What is the best way to proceed since we will need 1) Specs of the device being developed; 2) some assessment on the progress that the device will indeed be ready for further application development. Essentially, we need collaboration with the last year’s awardee. Please advise how to proceed? A: All our projects from the previous year are summarized on our website (https://poweramericainstitute.org/member-projects/) under About/Member Projects. Please contact the project PI directly, to explore collaboration opportunities. Q: For industry led projects, is it necessary to have collaborative partner from university, or is having a collaborative partner from national lab good enough? A: Having a collaborative partner from national lab in lieu of a university partner is acceptable. A: Yes, university partners are required, or (see question above) an industry led project can have a national lab partner in lieu of a university. Q: Can two projects submitted by two different divisions of a company have the same POC? Can the P.I. for one of the projects act as a consultant for the other? A: No. The same project lead (or Principal Investigator, to use university terminology) cannot submit for two different projects. The only exception to this rule is that one can submit one additional project as long as it is in Focus Area 5. Yes, the P.I. for one project can serve as a consultant on another project (provided that project has another individual serving as lead/P.I.). Q: Can a university submit a proposal for Power America’s call without any partner companies? A: As stated in the Teaming section of the Call for Projects document at the bottom of page 4, teaming between university and industry is required for Focus Areas 2-4, but is only strongly encouraged (but not required) for Focus Area 5. Q: For projects using commercially available devices, funding up to $800K for Industry: Does it mean the PowerAmerica share is $800K and industry needs match another $800k so the project scale is up to $1.6M? A: Yes, as described in the Expected Award Amounts section of the Call for Projects document at the bottom of page 3, the amounts listed throughout theCall for Projects document only represent the PowerAmerica award portion, and do not include the required 1:1 match, so yes in this instance total amount would be $1.6M, half federal funds from PowerAmerica and half cost-share contributed by industry. Q: There are conflicting pieces of information in the CFP Summary table that need to be clarified. On Page 3, under Expected Award Amounts, it says, “For organizations teaming/participating in multiple proposals: the maximum dollar amount those organizations will be eligible to receive will be limited to the organization specific funding limit for the given sub-topic.” But, On Page 4, under Multiple Applications and Awards, it says, “Only one (1) award will be made to any division/site of any business (whether proposals were submitted as an individual organization or as part of a team).” Which is accurate? Can we participate and be awarded in one proposal as Prime and in one or more proposals as a subcontracted partner? A: These items are not actually in conflict. Page 3 refers to the total funding ceiling for which a given applicant is eligible. You may participate in multiple teaming arrangements for multiple applications (but only serving as the lead on one). But regardless of whether only one or all of those applications are selected, your organization will only be eligible to receive up to the total award limit for the sub-topic (for example, $800K for industry for most sub-topics). Page 4 refers to the subaward itself–that is, the contract. So, to continue with the example from above, if both of the applications in which you participated were selected for funding, you would only receive one subaward, and it would be for the proposal in which you were the lead organization. For any other proposals accepted for PA funding, the lead organization on the team would be responsible for issuing a subaward to you. Q: We believe our team’s proposed project would fall under Topic 2.4, Gallium Nitride Power Devices. However, it would deal with vertical GaN development and we see that on Page 7 of the CFP document it says, “PowerAmerica does not have the capacity to fund: …Vertical GaN development (because it is at a low level of technical maturity)”. Does this mean you will not accept applications that deal with vertical GaN for this Call for Projects? A: With respect to WBG power devices, we fund projects that take technologies that have been proven at high-yields, from small scale production to large volume US manufacturing. Although significant strides have been made in vertical GaN devices, they are still bellow this level of maturity. Thus, per our DOE mission, we will not fund vertical GaN device projects for this year’s CFP or for our rolling call for Open Innovation Fund projects. Q: To apply for 2.4 Gallium Nitride Power Devices, would a teaming arrangement with University and fabless industry partner need to involve a US GaN power foundry partner in the proposal? Establishing a US GaN power foundry seems to be a separate effort covered in 2.2. A: Yes, this is correct. A U.S. based GaN foundry must be identified for both topics 2.2. and 2.4. Q: For topic 5.2, Short Course Development: (1) Is it 1 day maximum, or can we expand it to 2-3 days? ; (2) Can it be offered multiple (2-4) times a year? ; (3) Is it possible to include funds to subsidize participant expenses, such as food? What about travel if a participant is not local? ; Could it include funding to pre-record videos from experts in the area that teach fundamentals? A: With the exception of item #3, these parameters are all perfectly acceptable provided the proposal stays within the requirements (funding max, etc.) described in Topic 5.4 in the CFP document. For item #3, we should not subsidize the expenses of participants for travel and food. Q: The call for proposals indicates that we need to team with an academic. 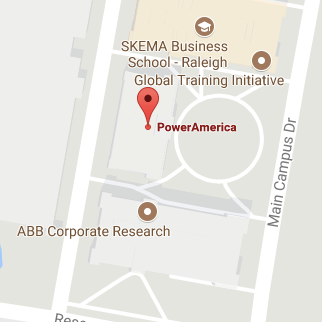 Do we need to team specifically with one of the Power America Faculty listed on the Power America site, or can we team with faculty that have not previously worked with Power America? A: Not necessary to team with PowerAmerica faculty, or even with a university that is not currently a PA member (although in order to receive funding, that university would have to become a PA member). Q: In the spec description for Topic 4.3e, what is meant by “two output channels which can drive two LED strings independently”? Is this one driver with two output connectors, or is it two separate DC-DC drivers? The latter might be cost-prohibitive in the market at this low power level. A: We provide architecture guidance, but we are open to all technically sound and cost effective (within budget) architectures. Q: We are in preliminary discussions evaluating WBG devices with a start-up company that has a US presence, but is not headquartered in the US. Can we as the lead industry partner propose a PowerAmerica project evaluating their devices for high density power conversion? A: Yes, if the startup has a US presence (in accordance with our eligibility requirements listed in the Summary table), then they can partner with a company with an established US manufacturing presence. Q: A company and a university are teaming to submit a proposal under Focus Area 2.1 (foundry). The company will be the prime. Of the $750K max award, what is the maximum amount that can flow down to the university? A: The Call for Projects document has been updated to better explain how this would work under Topic 2.1. For foundry proposals, the funding cap for university or national lab team members will depend upon the topic under which their project contribution falls. For example, if university or national lab contribution is through device work, then funding levels for Topic 2.3 would apply ($400K). So in that case, industry could expect to receive up to $750K and the university or national lab could expect to receive $400K. Q: Does an industry partner need to incorporate a lab/university partner into its proposal OR can the two submit separate but related proposals for a project? Also, can two universities be tied to one industry proposal and receive the full amount each for universities? A: Each and every proposal team must include an industry partner and a university or national lab partner. Yes, two universities can be tied to one industry proposal and receive up to the total funding cap allowable for each university partners. Q: Is the cost share for the education projects one to one? A: A minimum dollar for dollar match is required for all projects in all Focus Areas including education projects. Q: I would like to submit a proposal in Focus Area 5. Are industrial partner engineering time and license donation counted towards matching fund? A: Provided that the industrial partner can supply a breakdown of rates and justification for cost, labor is allowable for cost-share. For the cost of a license, this would only be allowable if the license will only be used for this particular project. Cost-share allowability is subject to the same rules and cost principles as federal funds. Q: We would like to participate in Area 5. I want to confirm 1) it is fine if there is no industrial partner 2) Is that PI’s time can be used for matching fund. A: We can confirm both. Focus Area 5 proposals do not require an industrial partner, though we do recommend it. P.I. time/effort can be used for cost-share/matching. Q: For topic area 4, can a team involve Industry and two university PIs, where each university PI receives the maximum allowable funding ($400k each)? For the single project team (industry plus two University PIs) should we submit one integrated concept paper, or three individual concept papers? A: For an industry team with two university PIs, Prof. A and Prof. B, both are eligible to receive the maximum funding in that topic ($800K total). For the single project team (industry plus Prof A and Prof B), a single integrated, comprehensive concept paper is desired. Q: For Sub-topic 4.3b Open Source Design: Do you have any power rating in mind? Do you want all the voltages to be available at the same time like a PC power supply or one output programmable to either of these voltages? Are their different power/current ratings for each output? Does 4 level mean 4 layers? We plan to use planar embedded transformer in the PCB. What exactly does open source mean? A: Regarding the first three questions: your design choice should be justified by your market analysis. Yes, “4 level” means 4 layers. Open source means reference drawings available to others. Q: If a commercial company submits a budget with funds allocated for equipment ($>5k), to whom does the equipment belong at the end of the funding period? A: Please refer to 10 CFR 600.134 for the definitive policy for equipment purchased under this award. The short answer is that equipment disposition at the end of the project is determined on a case by case basis. For universities in most cases there is an option to continue using the equipment beyond the award period of performance provided the equipment is used for research. Q: For companies partnering with NC State University, should the company and the NC State P.I. each submit separate full proposals for one project/task? A: Yes, the company and the NC State P.I. should each submit separate proposals. Please note that if the company and P.I. are teaming for one task/project, as described in the Call for Projects document, then both proposals should use the same SOPO and share the same task number. Responsibilities for the company and the NC State P.I. can be delineated within the shared SOPO document. Q: For the budget of the topic area 4 using commercially available device, if the University is leading a project with an industry partner (industry requesting $125K budget and $125K match). Does that mean the University can only request $175K budget and providing $175K match? or the University can also request up to $300K and providing $300K match? Should the University and the industry partner use the same eere budget justification form? Should the industry partner be treated as the contractual on the budget justification form? A: The university can request up to $300K with $300K match. For your reference, this is explained at the top of page 19 in the Call for Projects document. Yes, the university and industry partner should use the same EERE budget form, and industry partner should be listed on the contractual tab as a subrecipient if the university is the lead. Although it is only required for subrecipients to provide a separate EERE budget if they are requesting over $250K in federal funds, it would be helpful in this case to see a separate EERE budget for the industry partner. Otherwise, a detailed budget for the industry partner in some format is needed. Q: If we would like to propose a 2-year project, show we fill out the budget for two years or just budget for the first year? A: We can only accept proposals for 12-months projects, as Budget Period 5 will be our final Budget Period. Also, for all Budget Periods thus far PowerAmerica has asked applicants to only propose 1-year projects. Q: I am working with a PI who has been invited to submit a full proposal to this opportunity. As their research administrator, we are to submit on the PI’s behalf. Is this possible to do when we create our own account in InfoReady? A: You will need to submit the full proposal via InfoReady using the same account the PI used to submit the concept paper. We suggest reaching out to the PI for the login information. InfoReady offers a password retrieval function if that is necessary. Q: We are a large European company with U.S. R&D and manufacturing facility. However, we have different accounting system (IFRS vs GAAP). For that reason, do we allow to be the lead the project or we have to be subcontractor? Another related question is: is it allowed to change the project lead from a company that was in concept paper to a university in full proposal? A: Provided your company meets the requirements for having a significant U.S. manufacturing presence, the use of the IFRS accounting system would not disqualify your company from being a team lead. We don’t see any issue with changing the team lead for the full proposal.